Neuse River Trail – A 38 mile, scenic 10′ paved trail! A 38 mile, scenic 10' paved trail! The Neuse River Greenway Trail is a 10-foot wide asphalt path extending from Falls Lake Dam to the Wake County line, a distance of 33 miles. Along the eastern outskirts of Raleigh The Neuse River Greenway Trail follows the river from Falls Lake Dam to the Wake/Johnston County line. There are several river crossings along the way, including two on suspension bridges. The scenic, tree-lined trail offers numerous wildlife viewing opportunities, especially on its boardwalks through wetland areas. 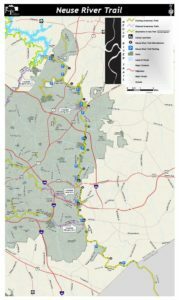 The Neuse River Greenway trail is part of the Capital Area Greenway system as well as the Mountains-to-Sea Trail that crosses North Carolina from the Great Smoky Mountains to the Outer Banks. Open to both cyclists and pedestrians, the Neuse River Trail is the longest greenway trail in North Carolina and the longest paved trail between northern Virginia and western Georgia. Parking is available at several points along the trail, including the lots listed below from north to south. Additionally, drinking water and restrooms are available at the Falls Lake Dam, Buffaloe Road Athletic Park and Anderson Point Park.